This month, having advanced in much of Syria thanks to Russian airpower, the Assad regime has been trying to consolidate its authority by notifyng relatives of detainees who were killed years ago. One of the thousands of detainees is Yahya al-Sharbaji. Last week, Sharbaji’s next of kin were finally given the news as they went through the process of obtaining a family statement from the civil registry department in Darayya, southwest of Damascus. They were told that he is listed in civil records as having died on January 15, 2013. There are no details on the place or cause of death. Sharbaji was a prominent activist in Damascus, joining the Darayya Youth to study principles of non-violence and to pursue projects such as street clean-ups and anti-smoking and anti-corruption campaigns. 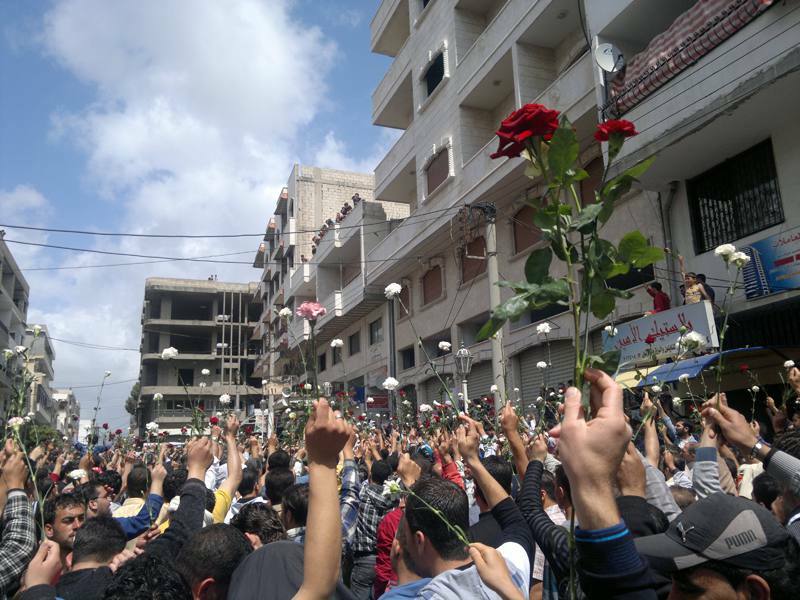 Soon after the 2011 uprising, Sharbaji became known in Darayya as “the man with the roses” for his idea that protesters give flowers to the members of the security force. He was also noted for offering security personnel bottles of water on hot days. We will insist on peacefulness until we build a new Syria without violence and build a state that can solve its internal problems with reason, not with weapons with which the Assad regime uses to solve its problems with the people. When we offer flowers to the army and police, we provide them to ourselves in the first place…. How [has] the Assad regime distorted the people to this extent when it made the shabiha forces [pro-Assad gangs] cold-bloodedly kill their fellow citizens? The Assad regime has ruined the people from the inside. In September 2011, Yahya’s brother Mohammad was seized by Air Force Intelligence officers. According to the Sharbaji family, Mohammad was forced to call Yahya: he told his brother that he was injured in the Damascus suburb of Sahnaya. When Yahya arrived at the location, he and fellow activist Ghiath Matter were ambushed by the intelligence officers. Ghiath Matter’s body, marked with signs of torture, was handed over to his family four days later. The Sharbaji family have now learned, from the civil registry department, that Mohammad died in detentino on December 13, 2013. Like thousands of other families, Yahya’s relatives cannot take any legal action to find out the cause of death or even to receive his body. There is no indication of where he may be buried, although previous detainees have been put in mass graves near a military hospital and the notorious Branch 215 of Air Force Intelligence in southern Damascus.